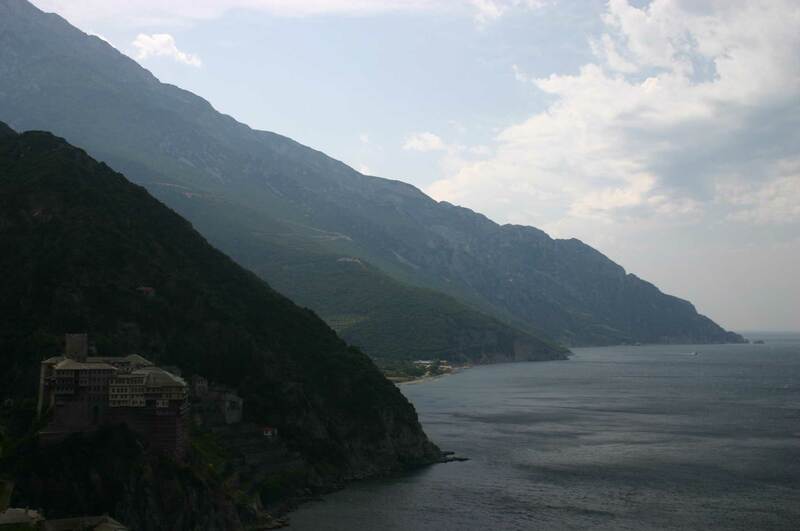 The mountainous monastery peninsula of Mt. 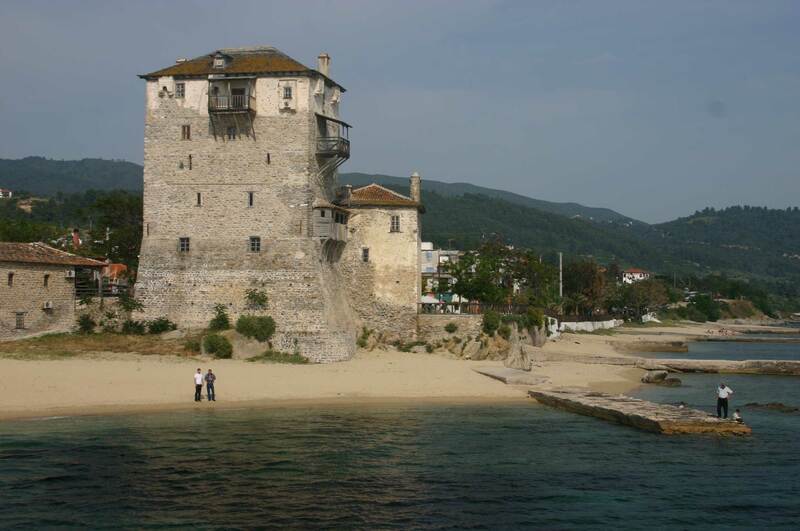 Athos protrudes, as the easternmost finger of the Halkidiki Peninsula, some 60km into the northern Aegean Sea. 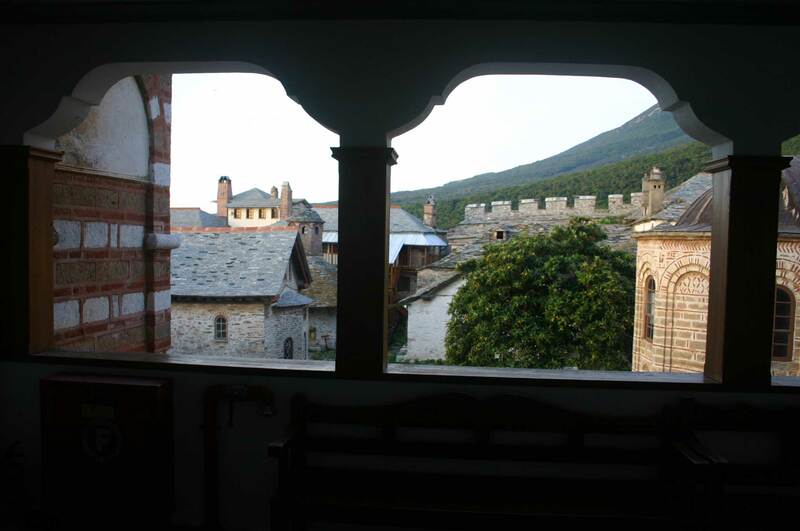 It is home to a multitude of Orthodox monastic houses, fortified against the raiders of history, which perch on crags and slumber in sandy coves. 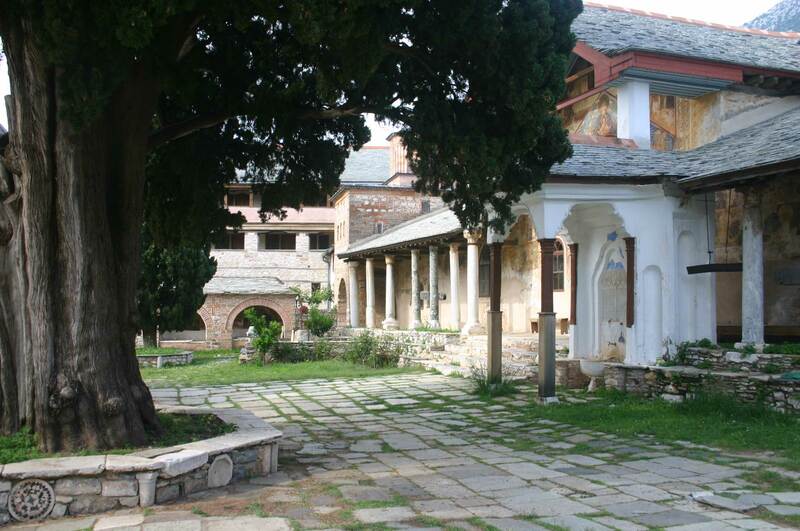 They shelter beautiful, ancient buildings, paintings and other treasures. 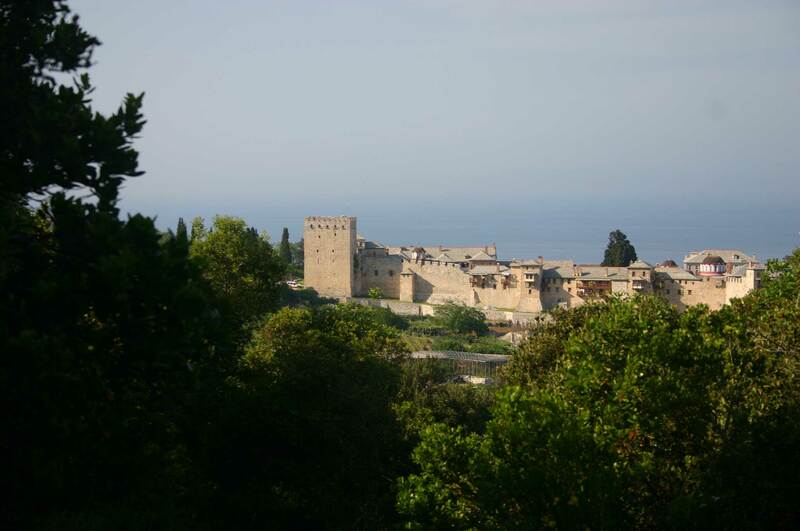 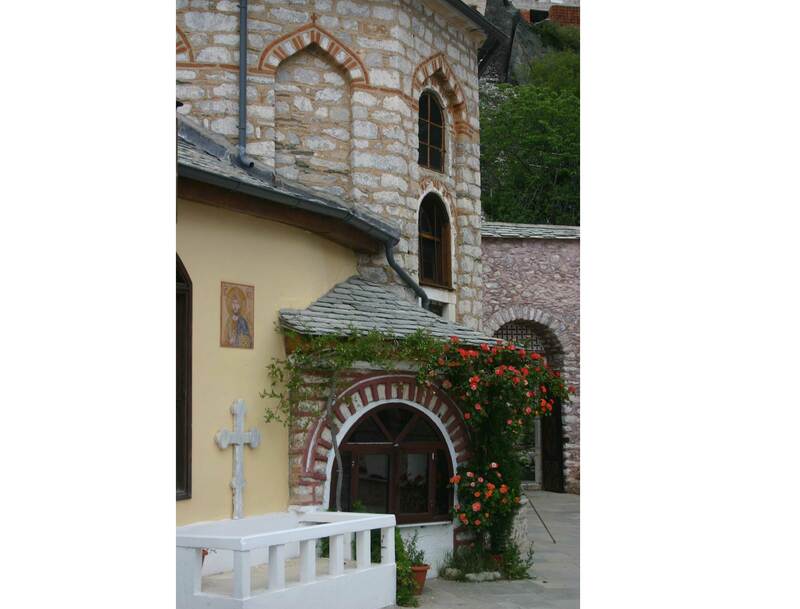 Walk on the ancient paths, contouring cliffs and crossing the wooded hillsides, that link the monasteries. 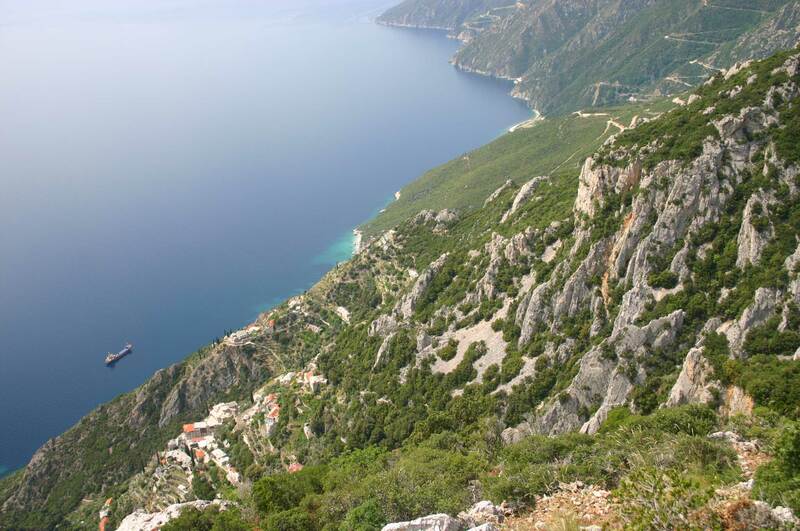 Enjoy big views of the rugged mountains and the sea and the beautiful and varied vegetation. 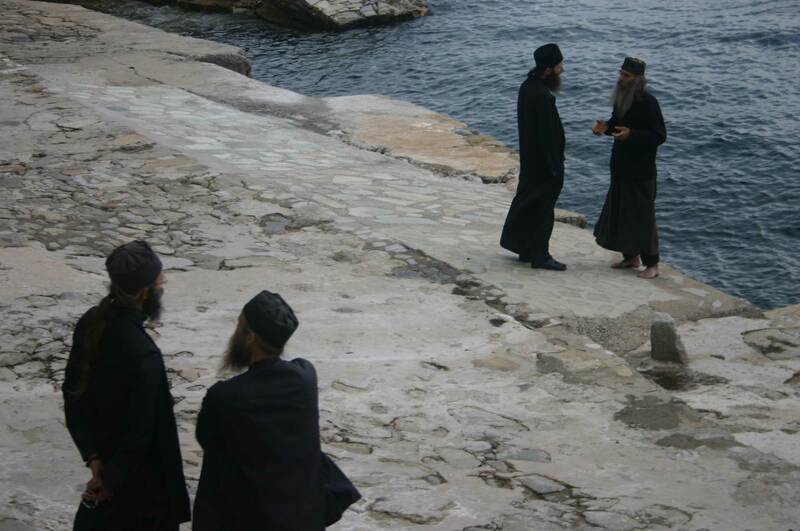 Only men are allowed on the peninsula. 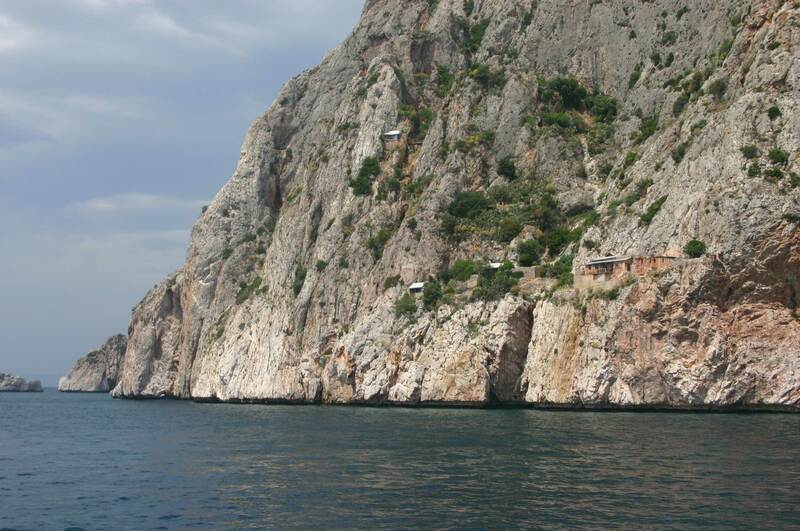 Access is limited and permits are hard to get. 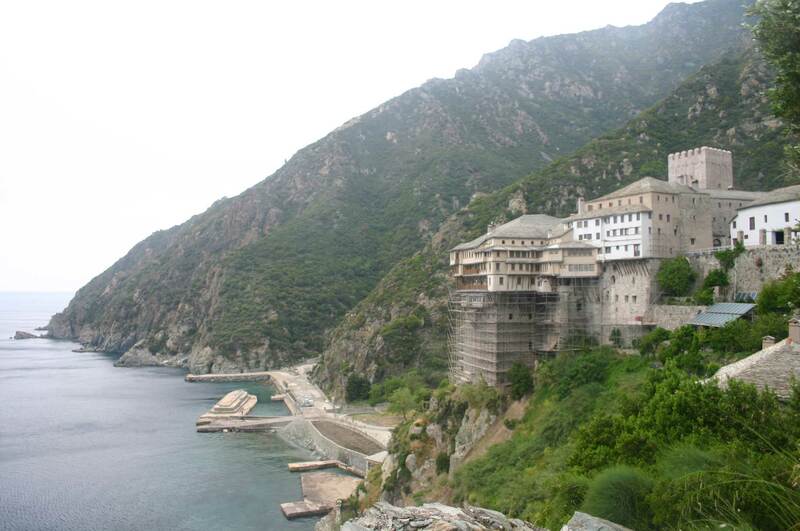 Mount Athos is a last living vestige of the Byzantine world, a unique, self-governing, monastic statelet, the eastern finger of Greeces Halkidiki peninsula. 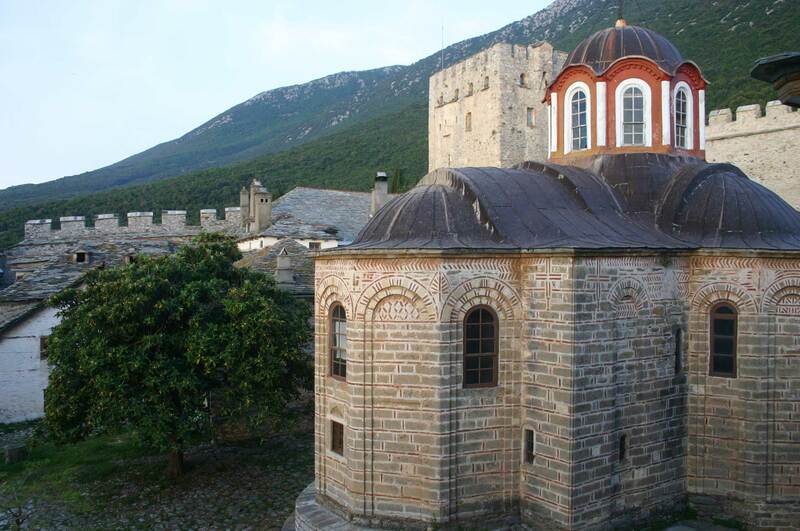 It is now a world heritage site. 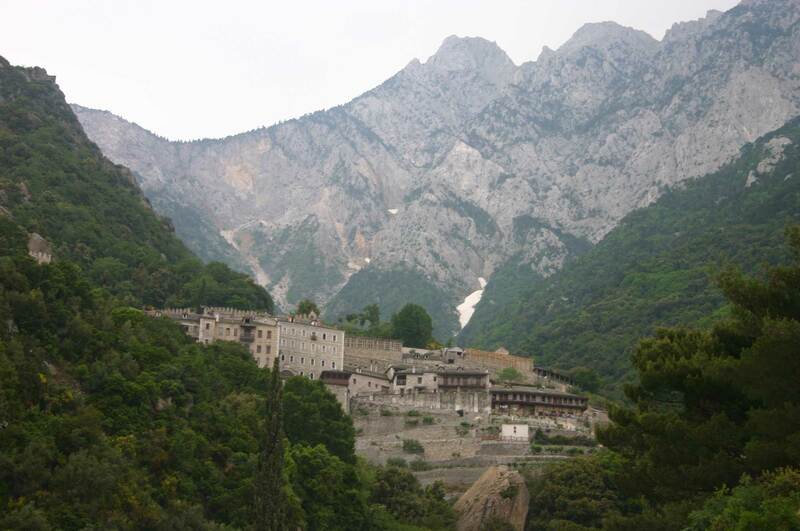 Women and, famously, beardless youths and female animals are excluded, and only monks live here permanently. 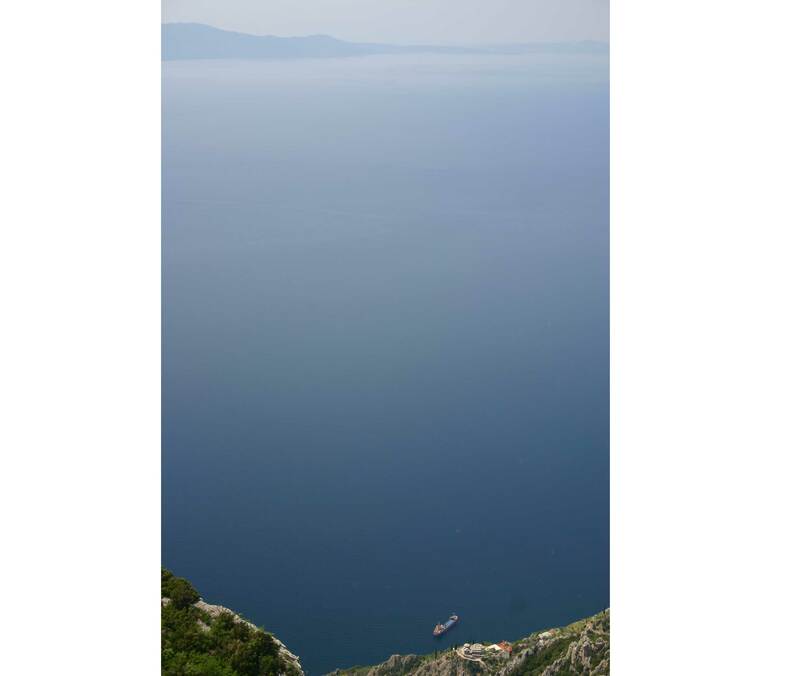 It is tough getting there. 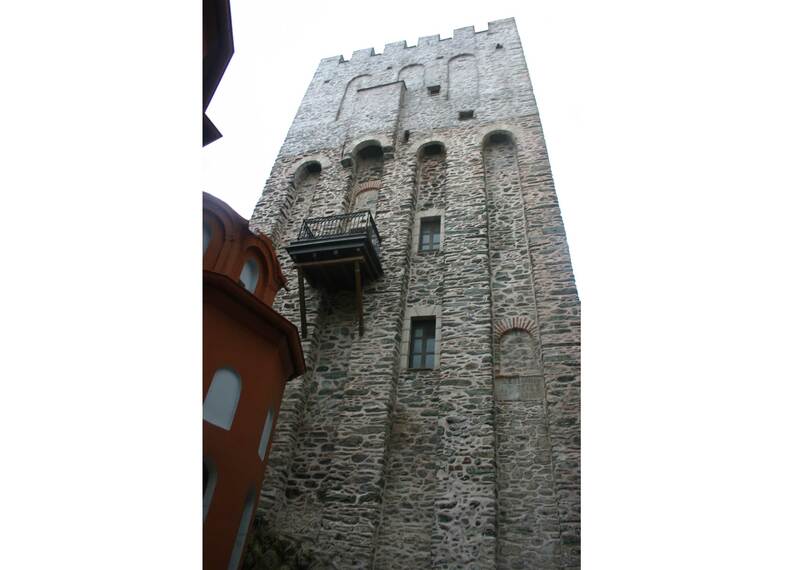 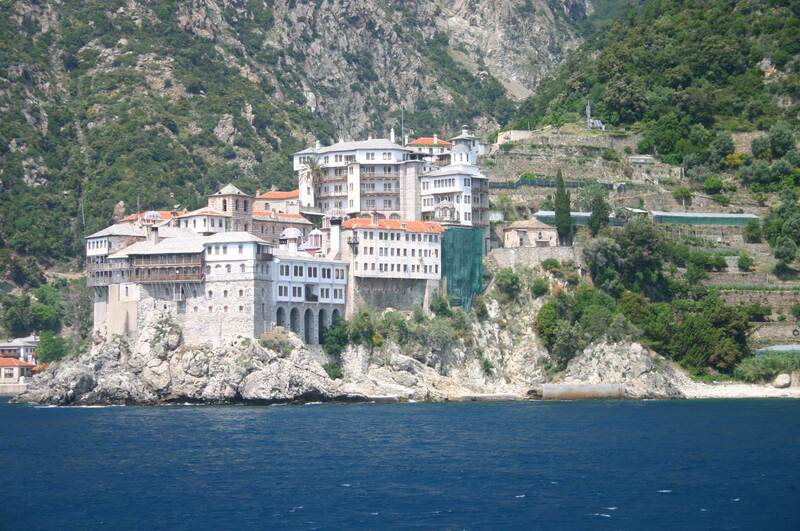 Athos is only accessible by sea, so access can be regulated - and you have to have a pass to be allowed in. 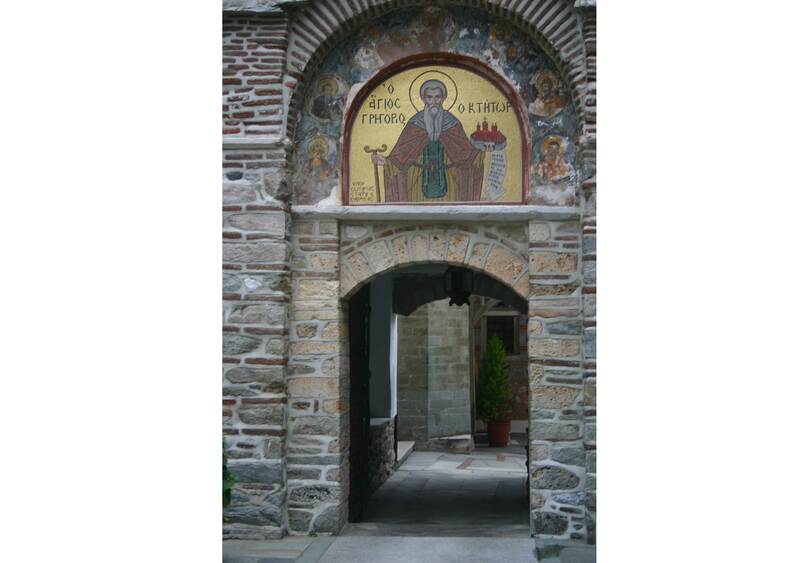 A mere 10 non-Orthodox visitors can enter each day, and you have to apply for entry exactly 6 months ahead. 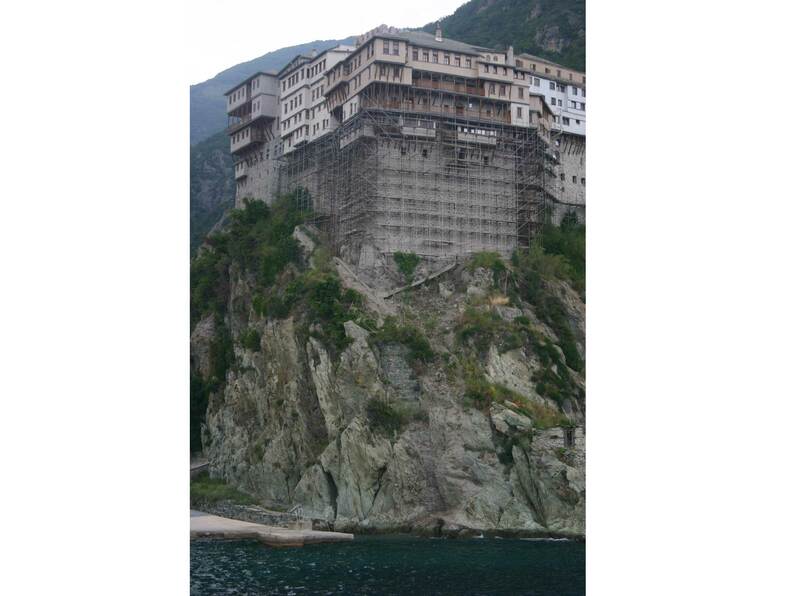 Nestling in Athos' gorges and forests, or looming on seaside crags, are a plethora of monasteries and lesser houses, many of them living museums housing priceless icons, paintings, books and other treasures, which shelter nearly 2,000 Orthodox monks. 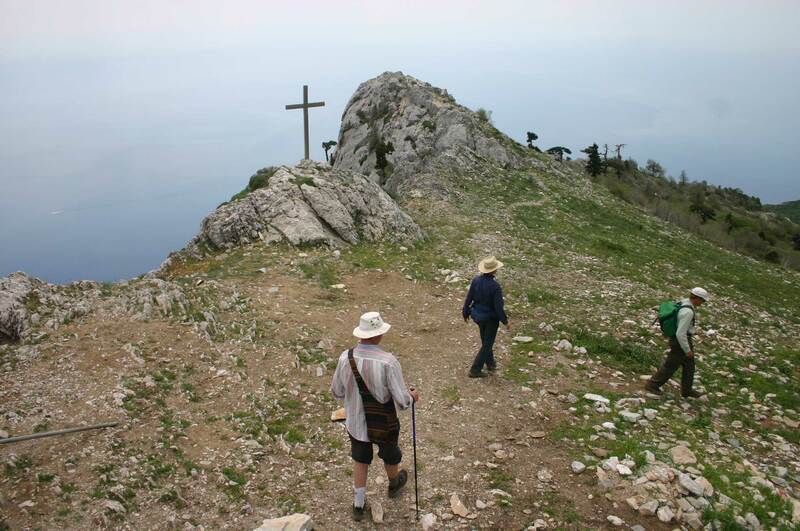 In its heyday there were tens of thousands here. 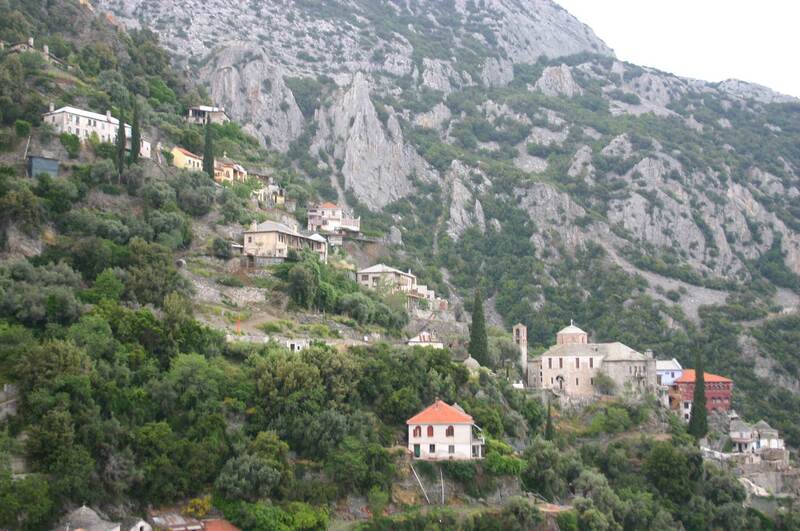 Many still live in scattered hermitages and sketes groups of monks living idiorrhythmic, self-regulating, lives. 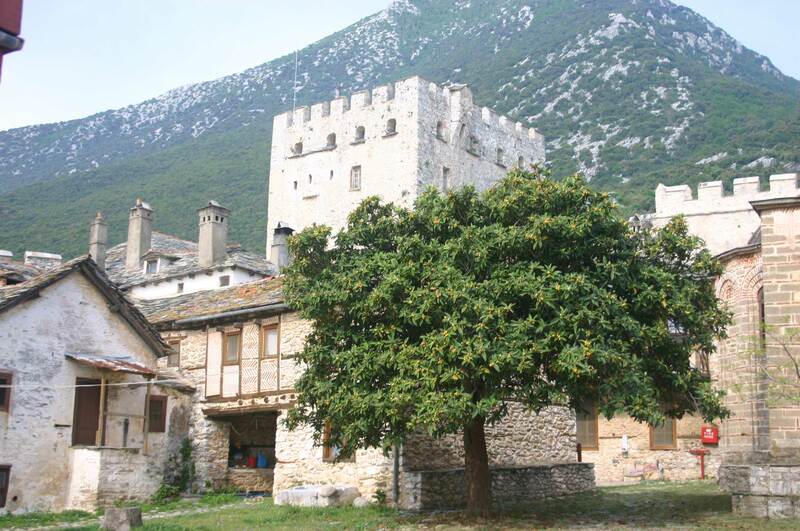 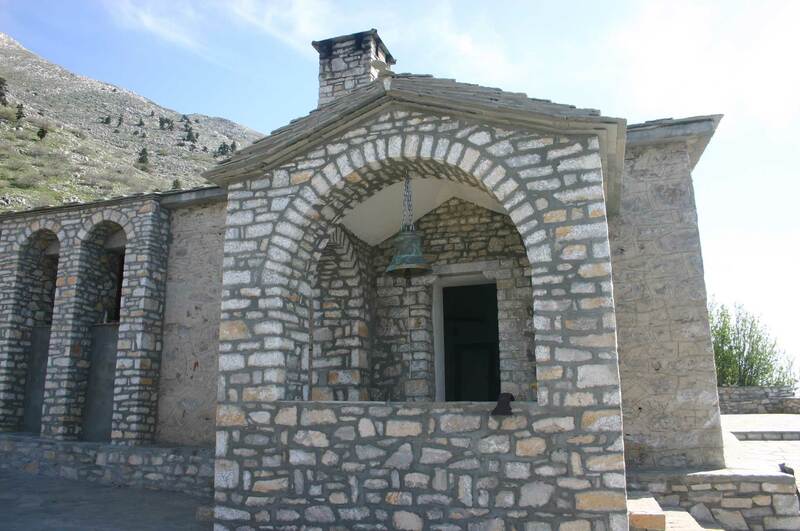 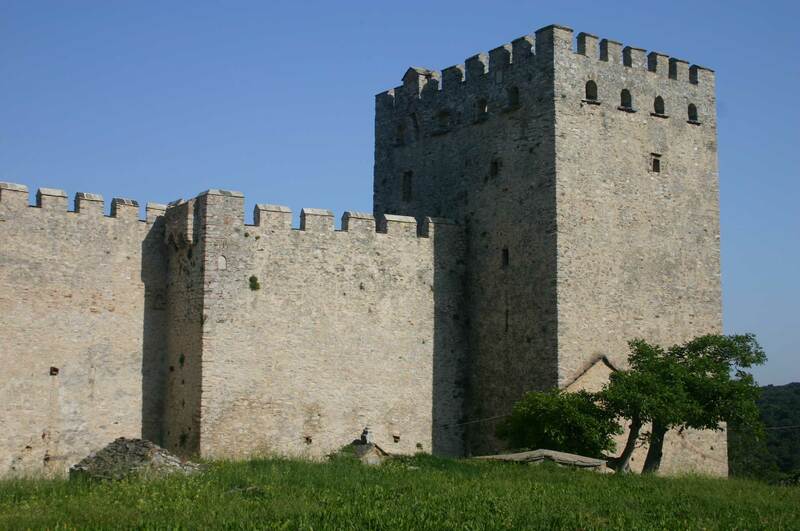 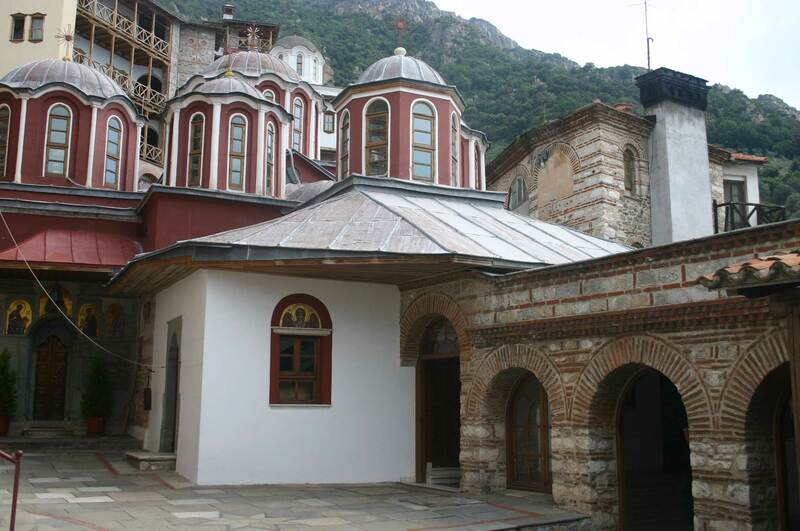 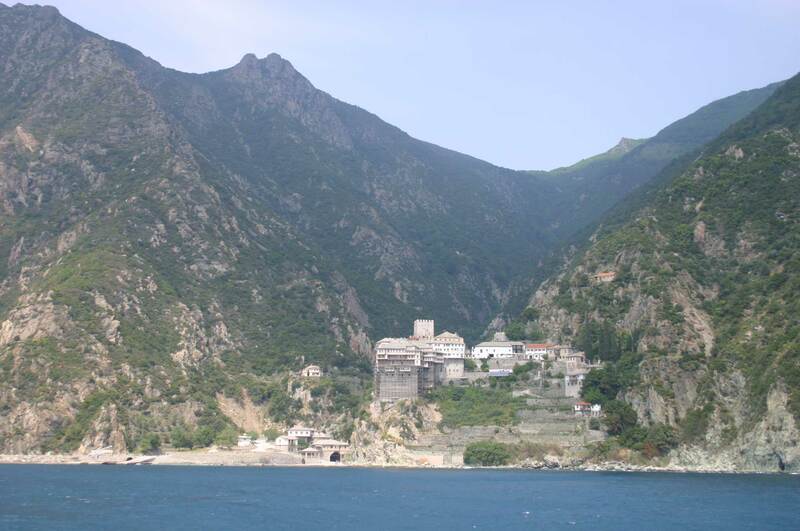 Remember: Athos is sacred, an Orthodox monastic place of retreat. 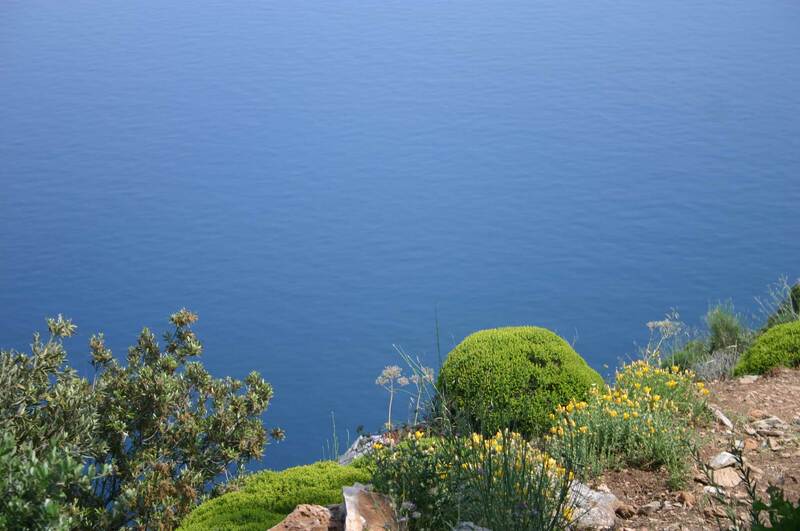 Don't go unless you will go in a spirit of enquiry and respect. 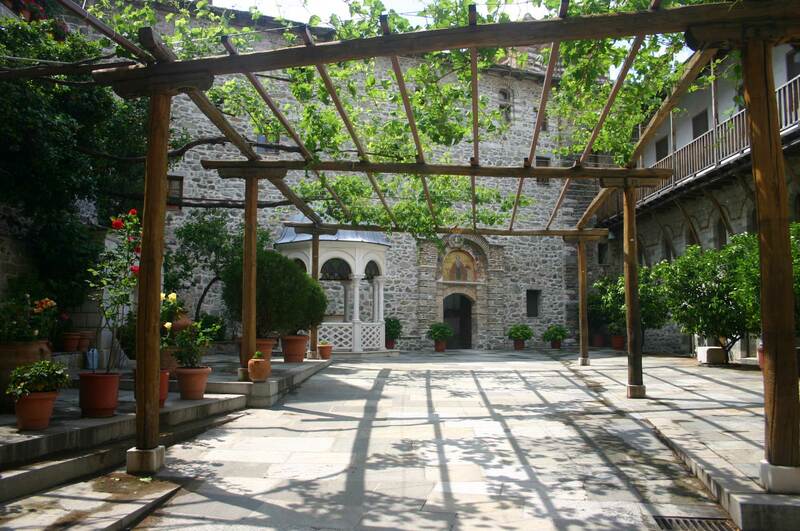 You can only stay in the monasteries and sketes, and it will be wrong not to attend services while there. 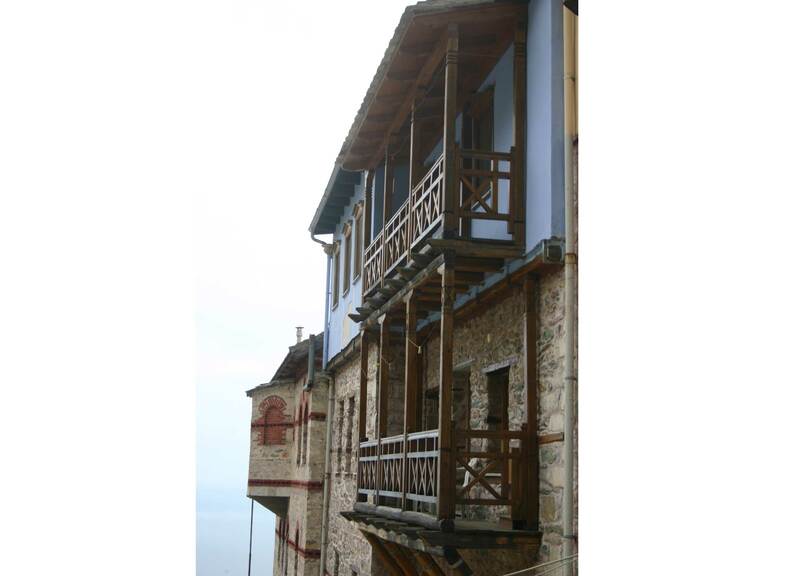 Most houses now require advance booking, so plan ahead. 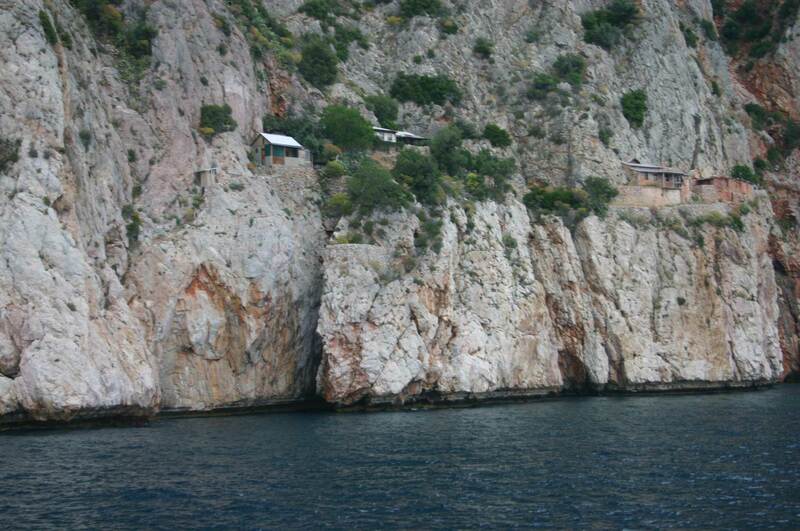 Some are very small and only have a few places. 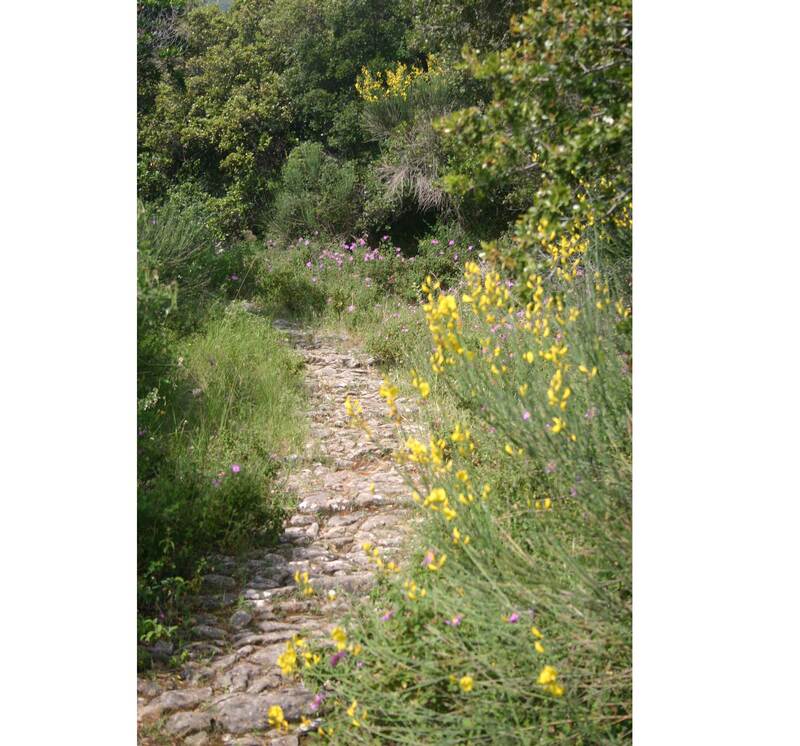 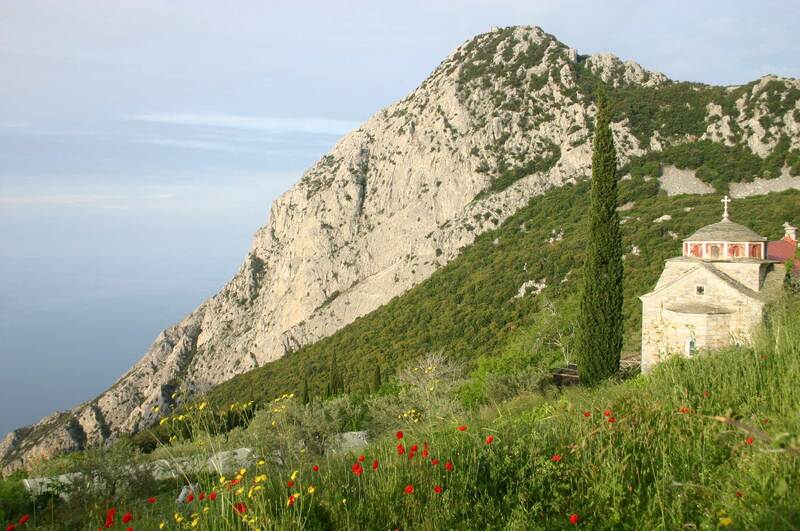 You can get round much of the peninsula by bus, but the traditional way is what will appeal to Walkopedians: on foot along the many remaining ancient paths and mule tracks, to Athos' remotest places. 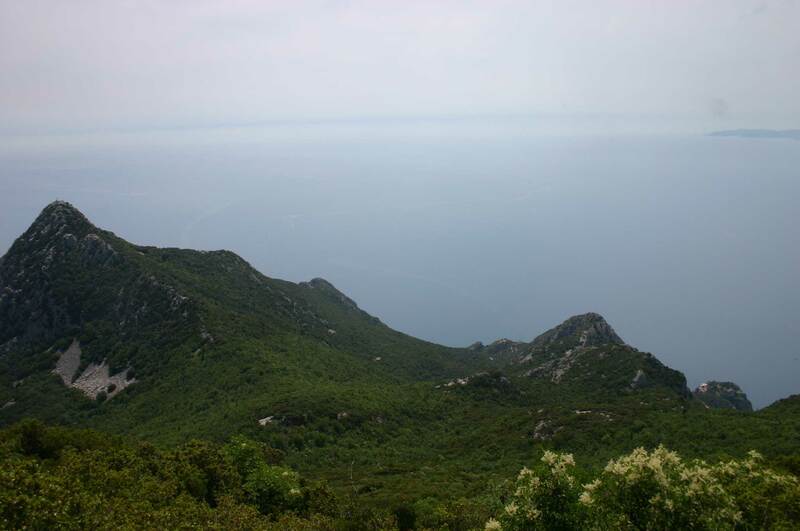 While this can be done throughout the peninsula, the only truly untouched area is in the wild south, below the great marble peak, at 2,030m the highest point for miles around. 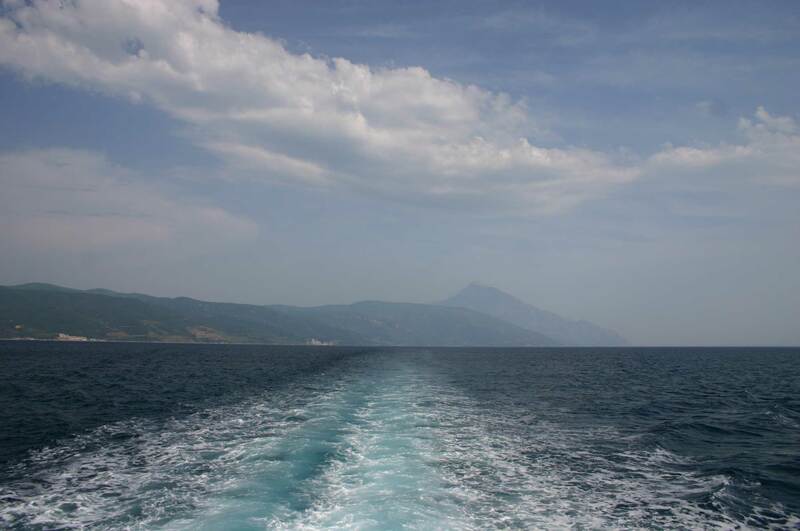 This will mean taking a bustling little ferry from Ouranopoli just north-west of the boundary wall, getting off at your chosen destination. 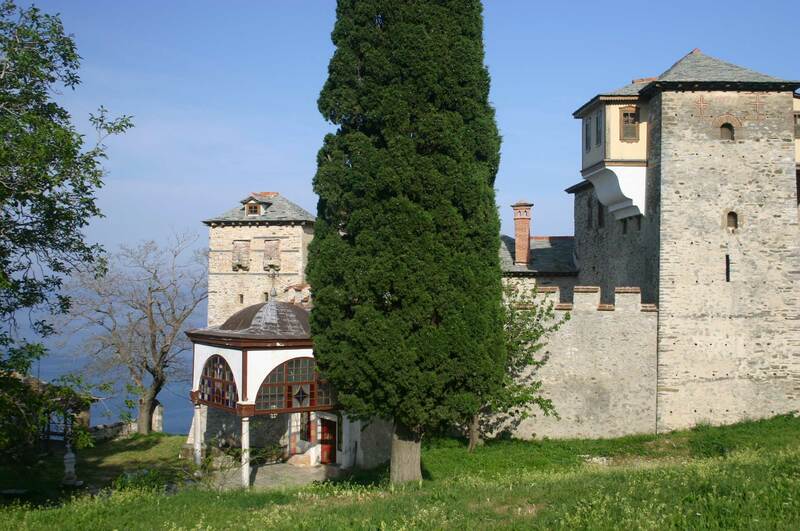 There are many possible routes, but the best and most varied in the time available (a maximum of 3 nights for non-Orthodox visitors) would be to land below the Kavsokalivia skete and walk to the Grand Lavra, the oldest (and grandest!) 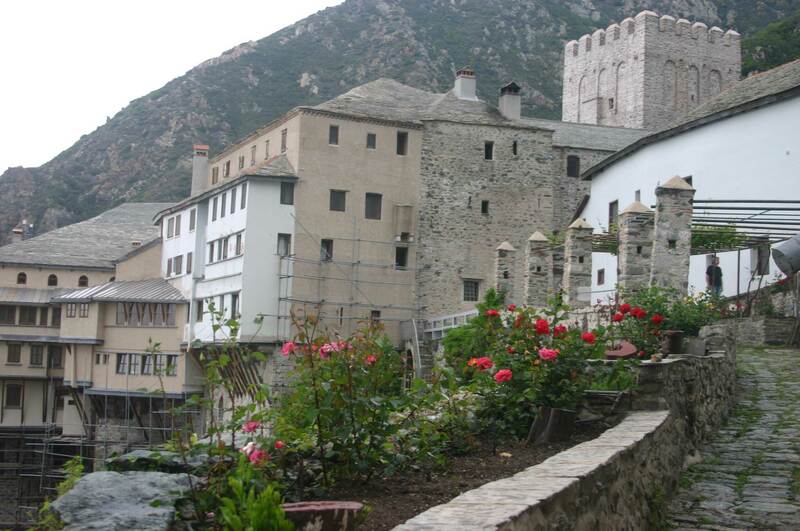 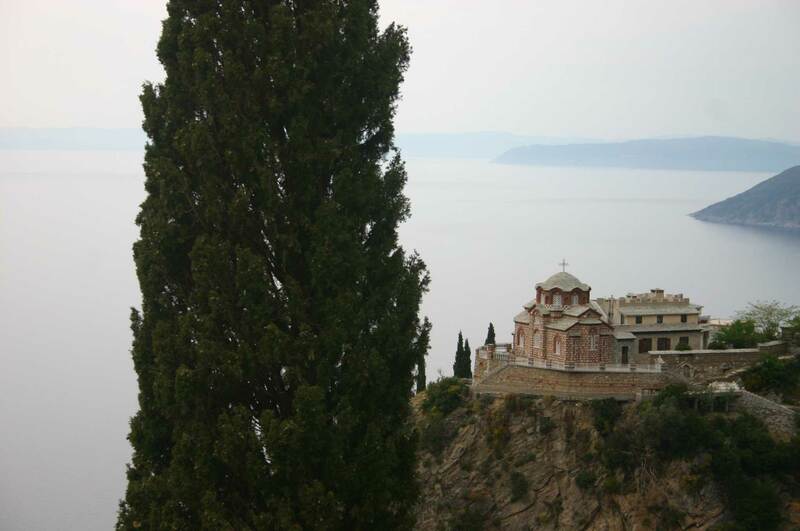 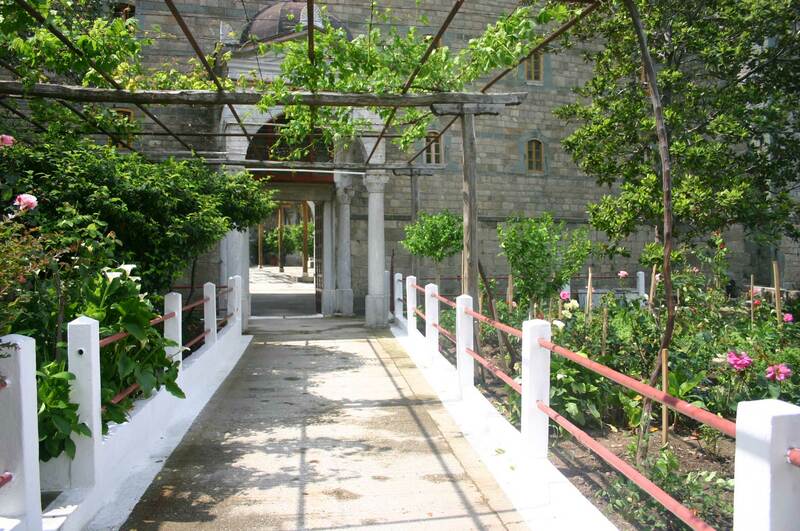 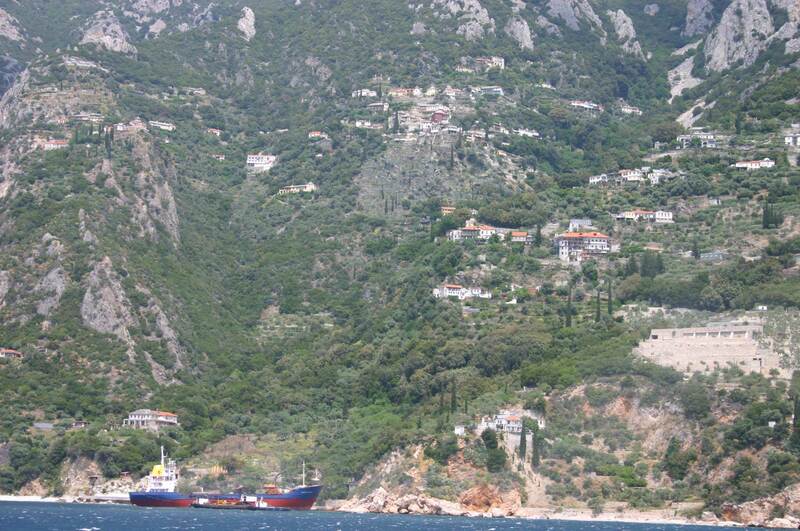 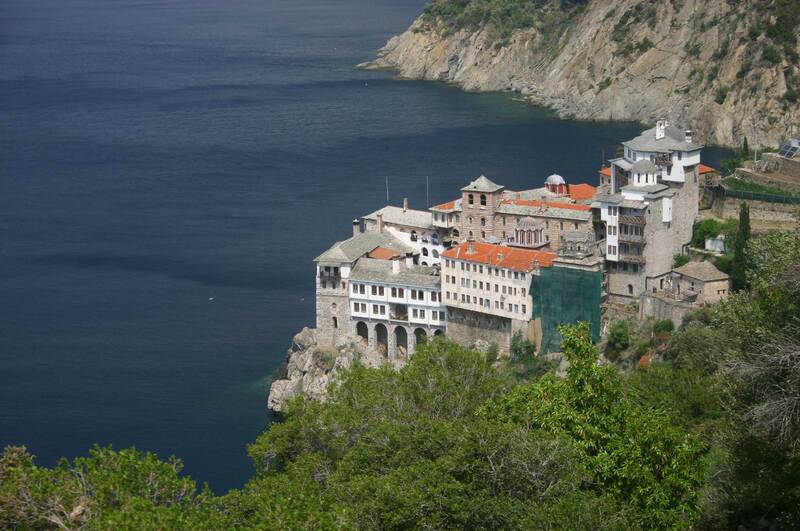 monastery on Athos. 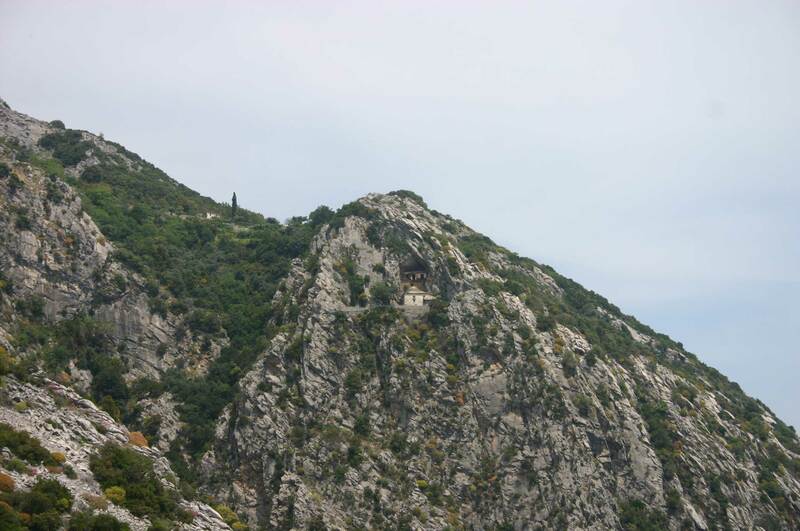 The track contours the cliffside through gorgeous maquis. 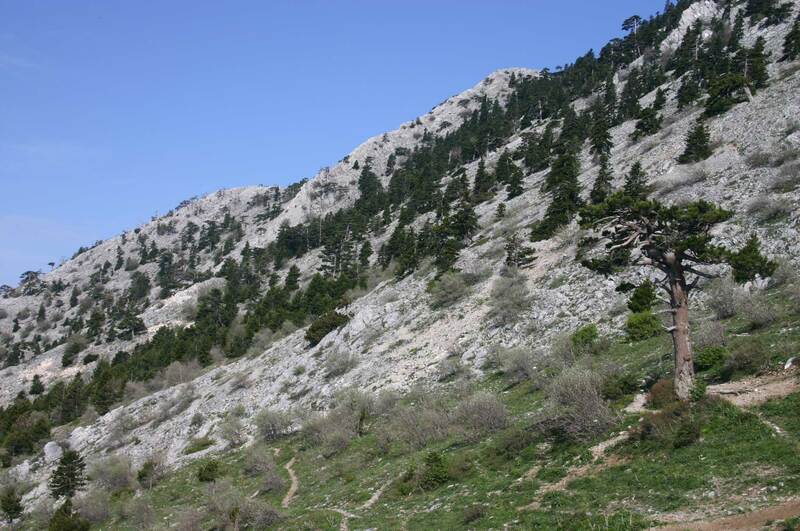 The second day is a long march westward across the forested lower slopes. 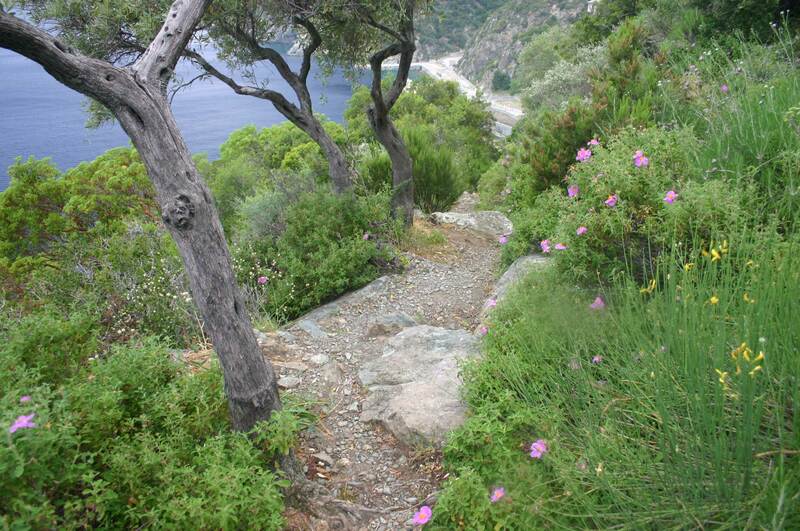 This is ravishing walking, though perhaps not as extravagantly furnished as yesterday's trail high above the sea. 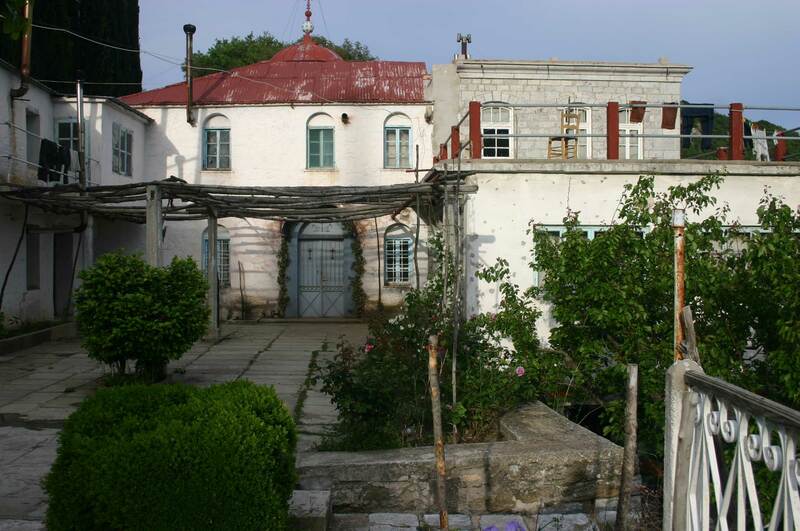 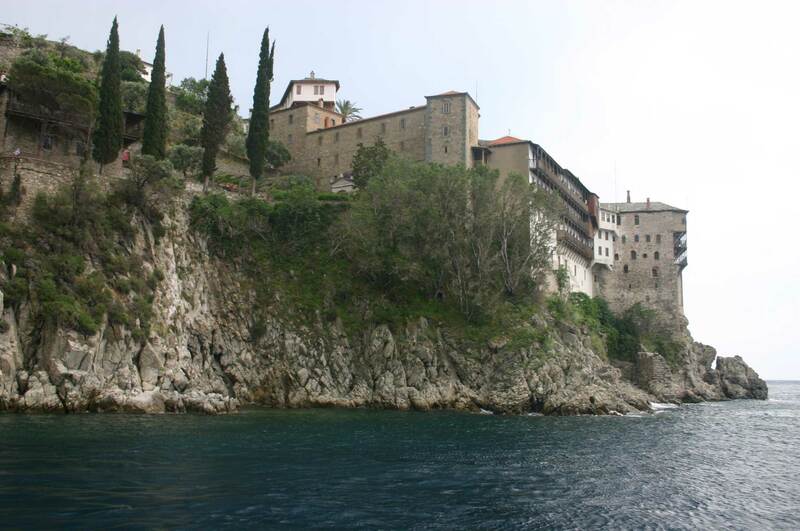 There is something delightful and deeply moving about the destination, the Kerasia skete, where we are to spend the night. 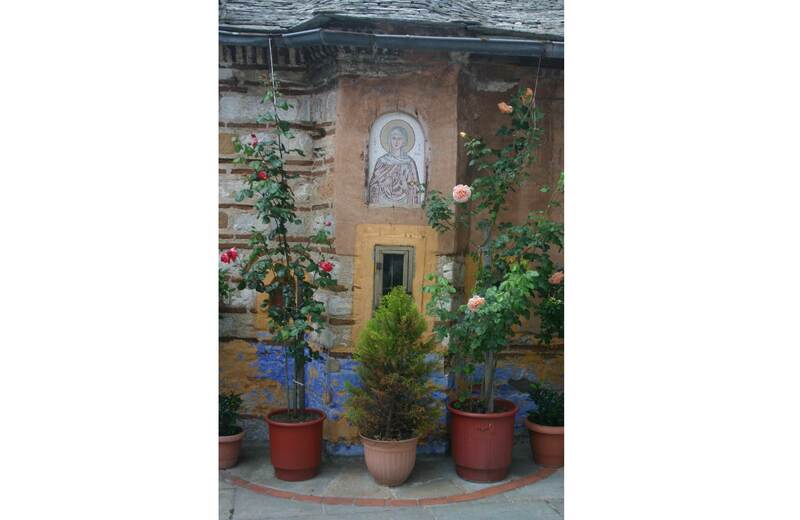 The contrast with the grandeur of the Lavra could not be greater. 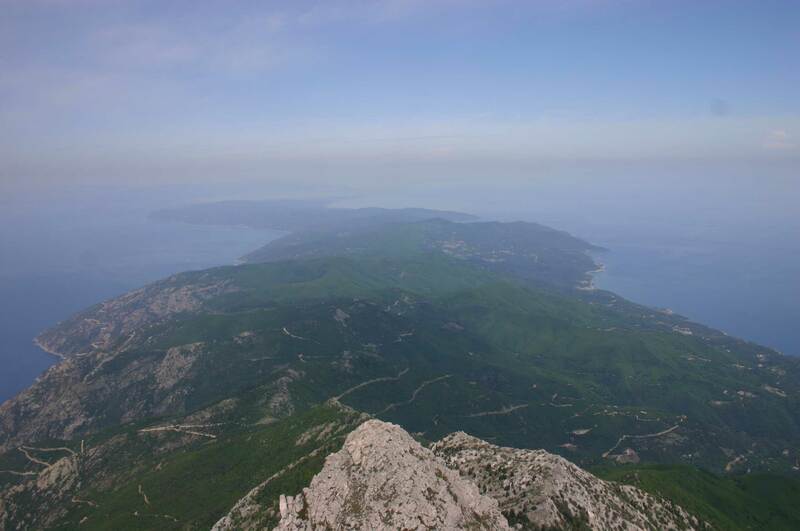 You will need to be up early for the big climb of Mt Athos, which is a demanding toil, but produces amazing views of the whole peninsula. 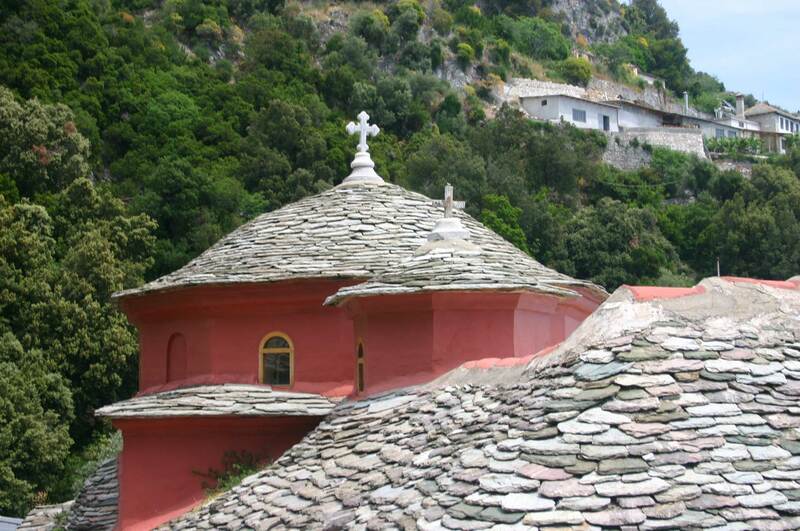 There is a choice about where to spend that night, depending on how fit you are: St Anna, the mountain's oldest skete, is probably the nearest and has the sort of view that could cost hundreds a night on the Amalfi coast. 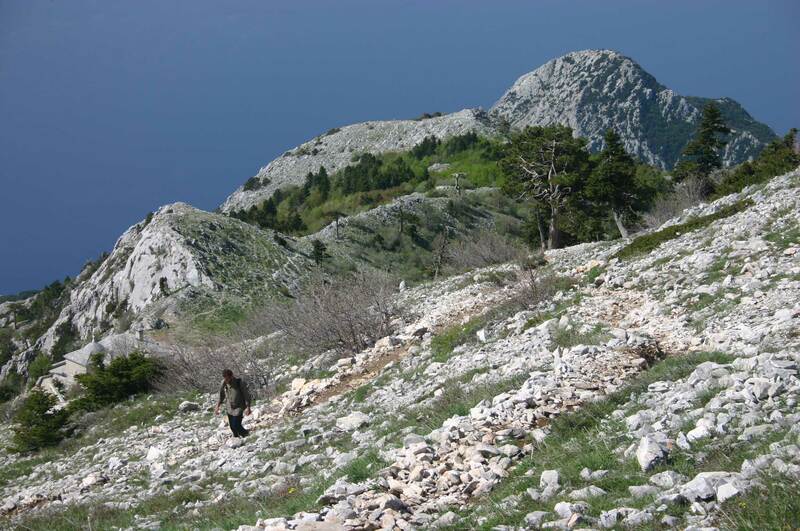 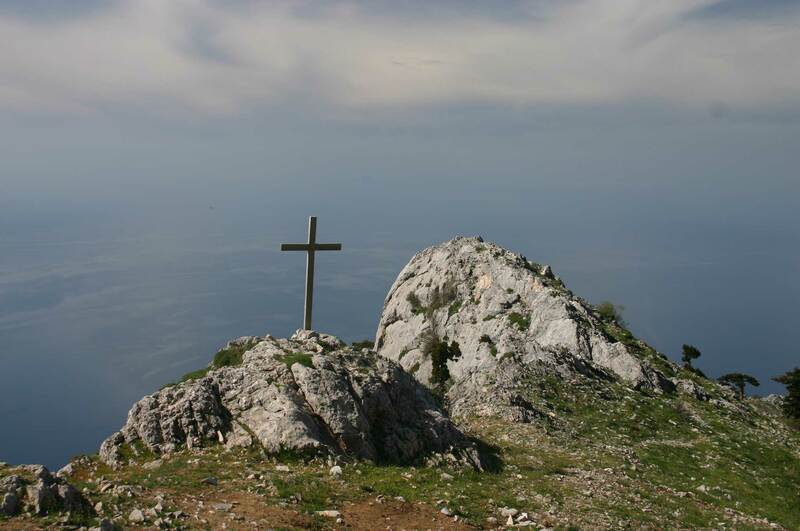 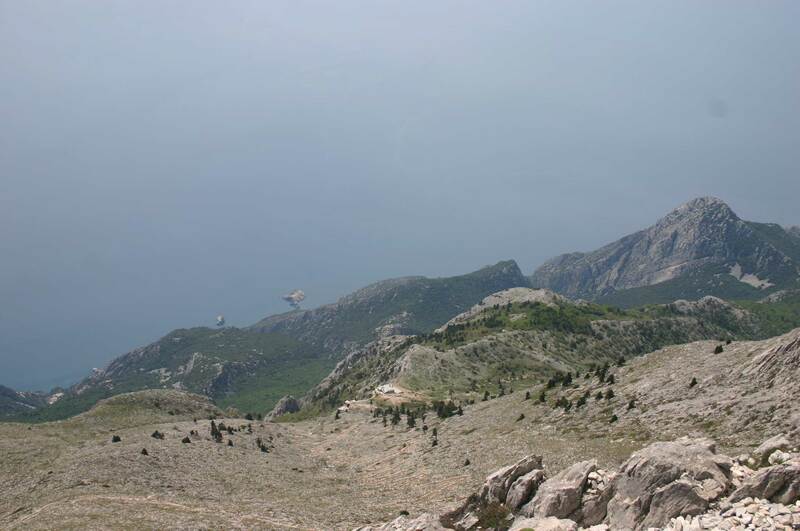 The last day follows glorious paths high above the west coast, visiting dour Pavlou and beautiful Dionysiou and Grigoriou. 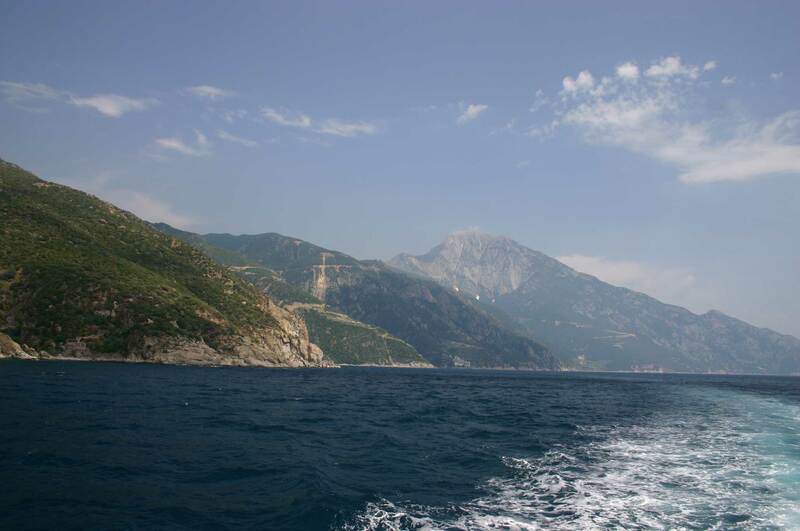 You can get a ferry at Grigoriou, or press on to the port of Dafni - but that will make for a long walk with a tight deadline to get the last ferry out. 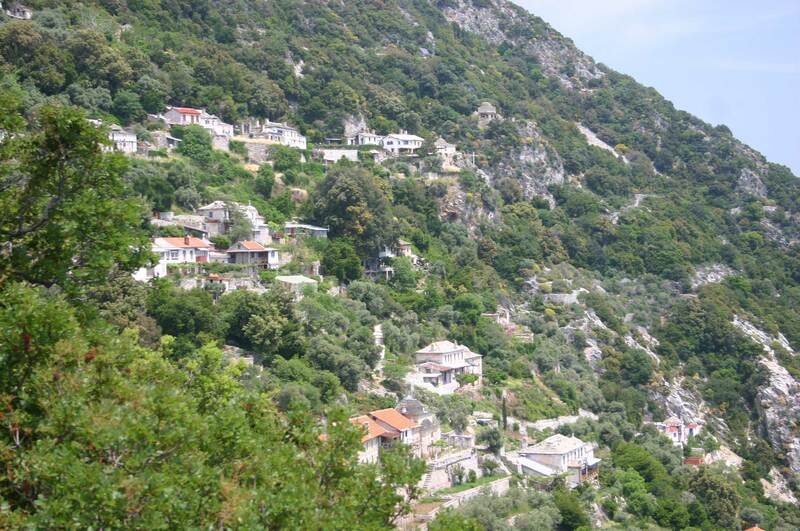 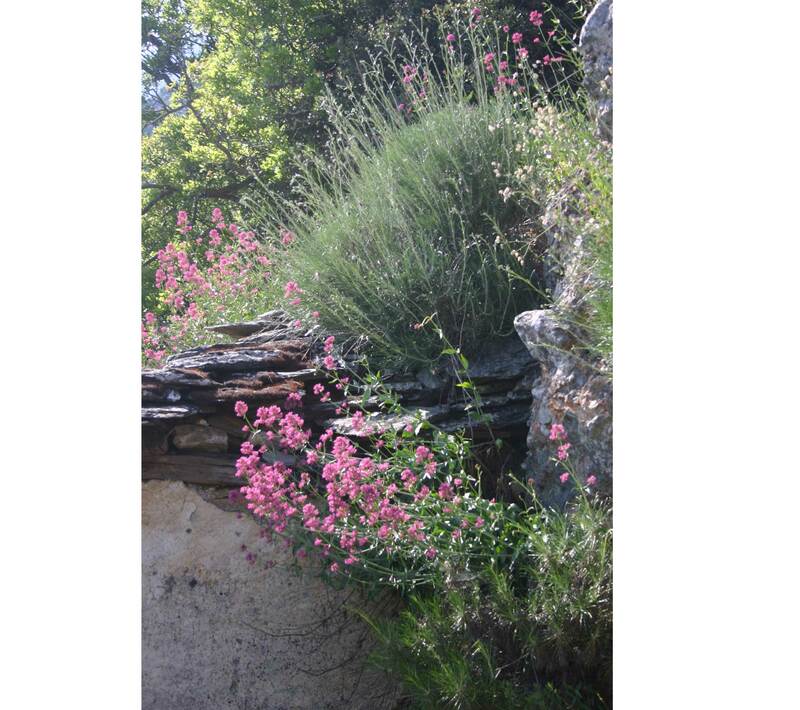 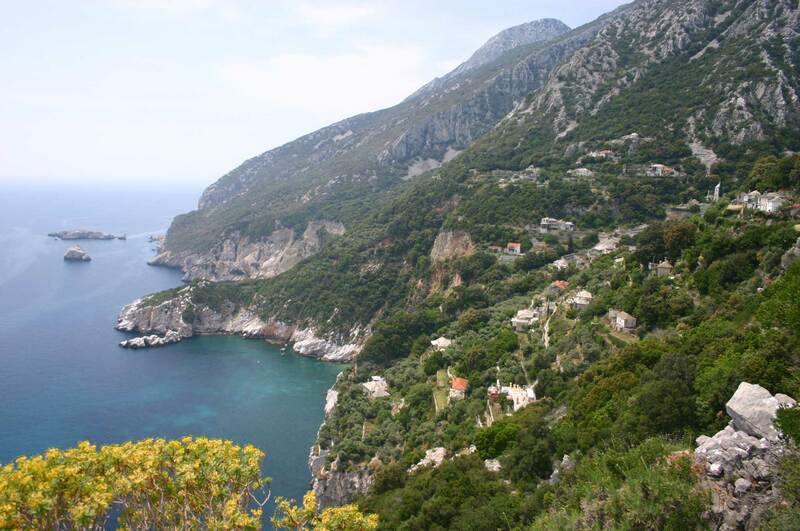 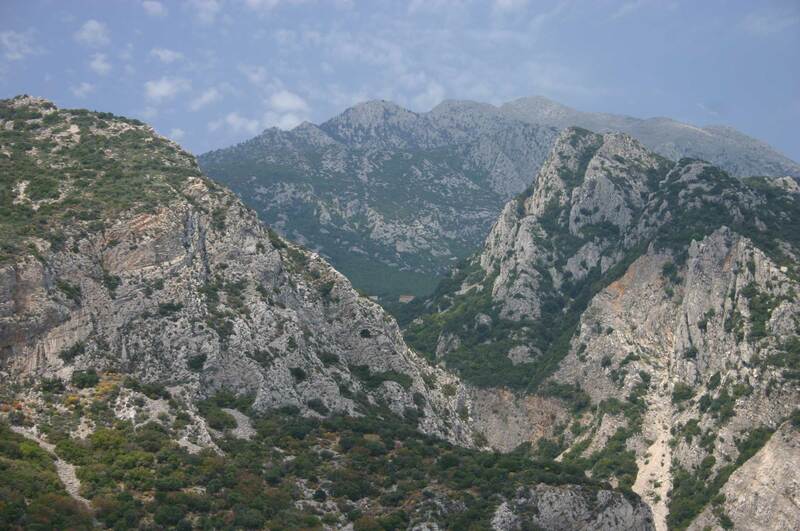 The scenery on Athos is superb - precipitous mountains, pinnacled cliffs and sea - as is the vegetation; a marvelous mix of forest, much of it still virgin, in the south particularly; and bright and varied maquis of bush and shrub. 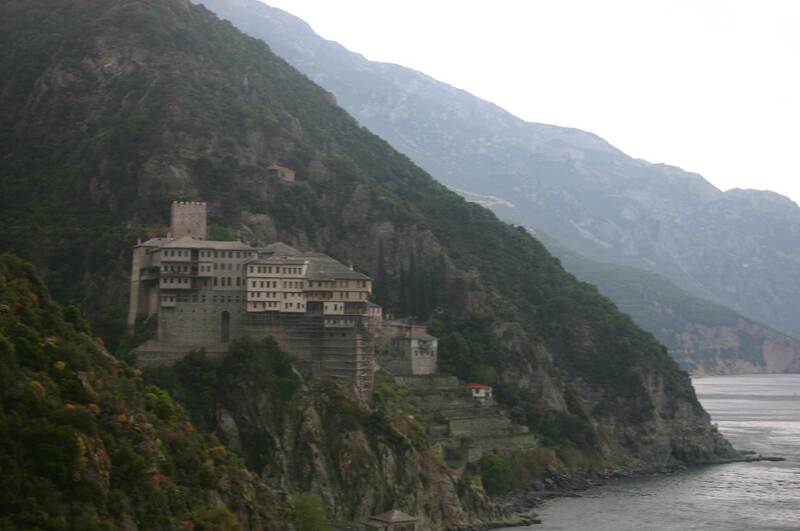 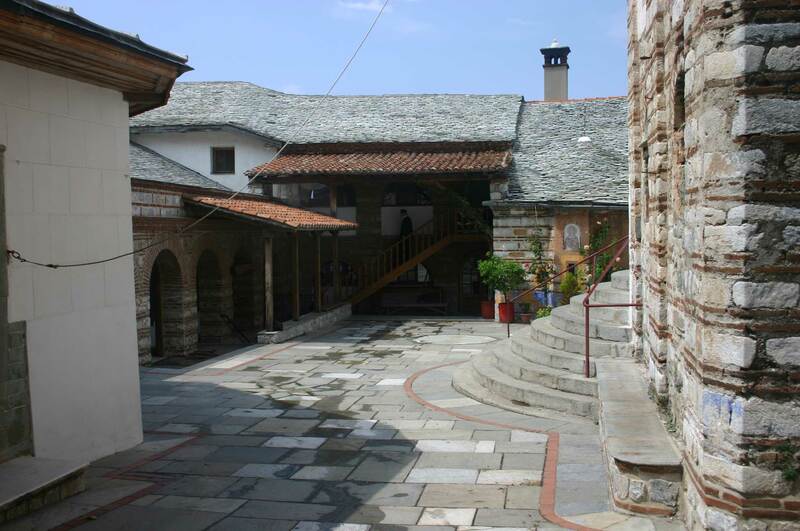 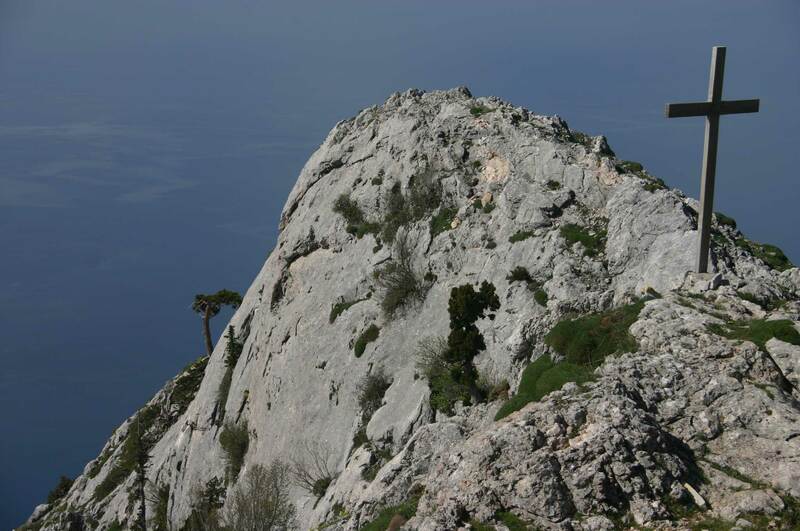 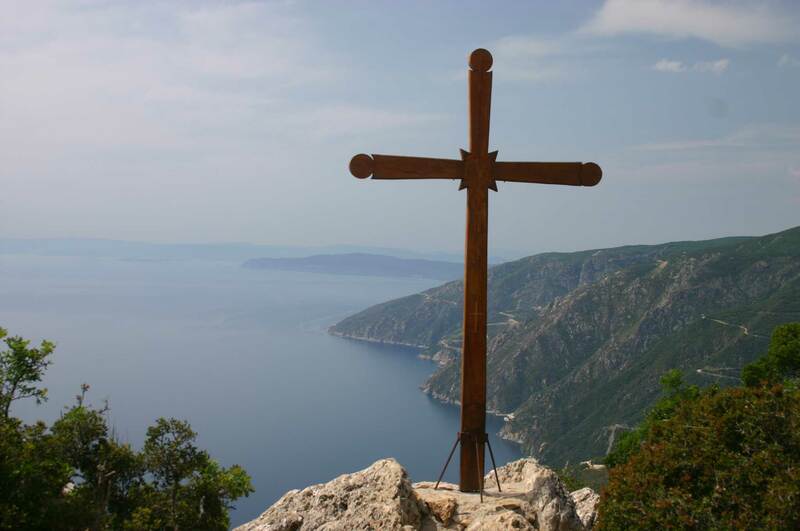 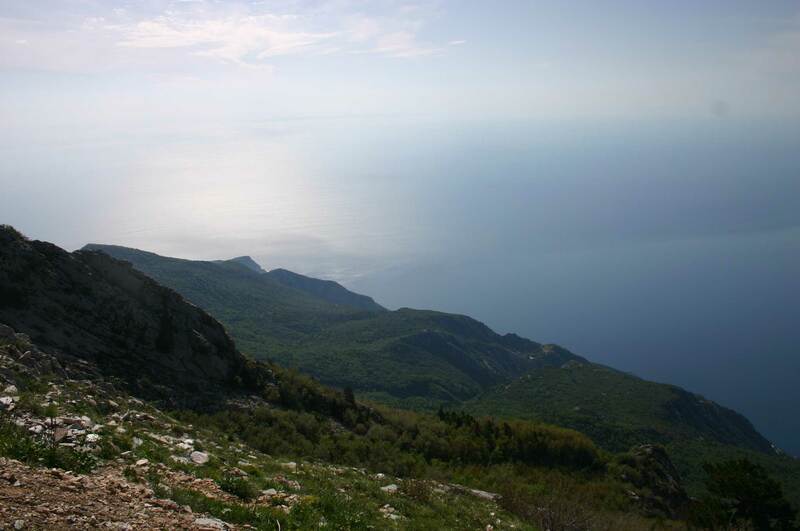 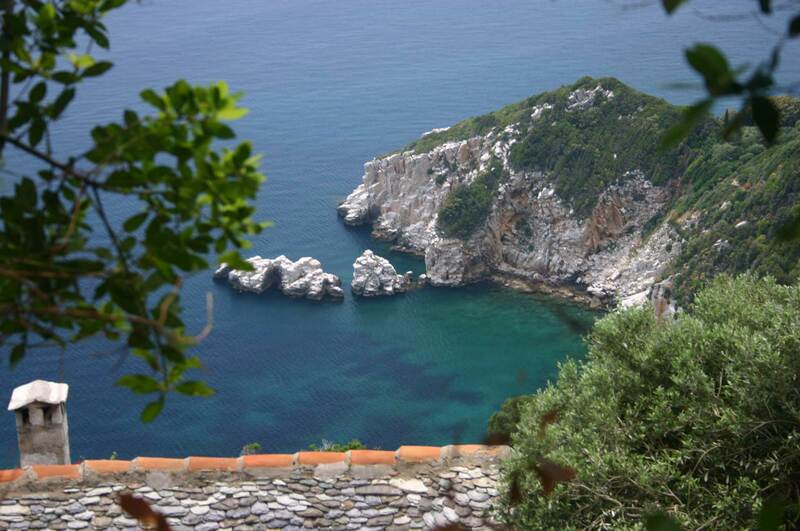 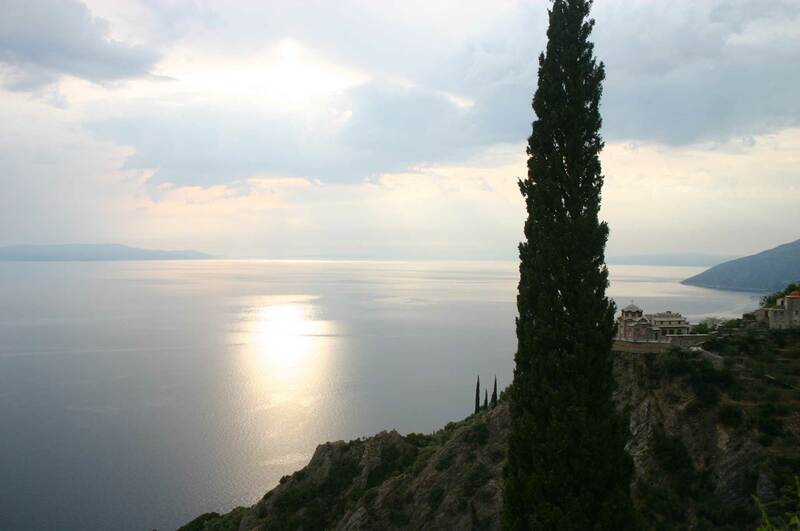 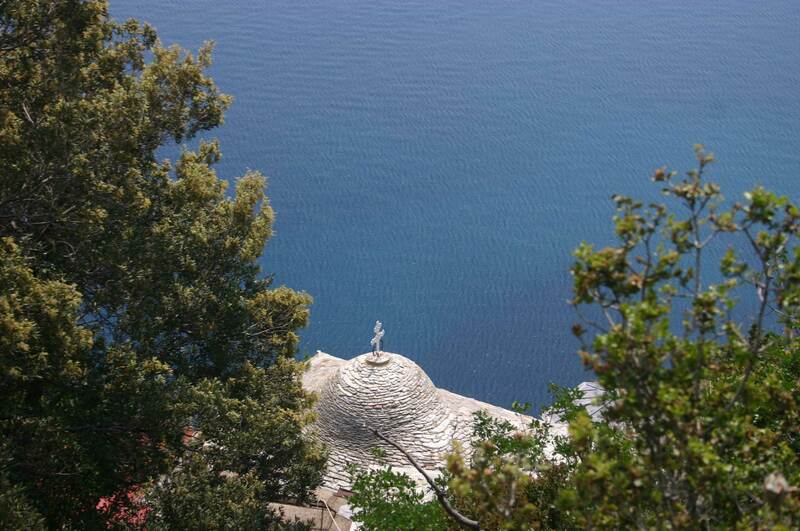 In May 2009, after interminable preparations, four middle-aged Englishmen made the pilgrimage-journey to Mount Athos, the sacred eastern finger of the Halkidiki peninsula in northern Greece.